There you have it boys and girls, Loose Women meets Soccer Saturday. A perfect combination. A new pic of the whole set. Unbelievable Jeff, its like Soccer Saturday. You're forgetting 2 important things the Soccer Am/Soccer Saturday format has been tried and tested for years plus excluding Helen/Lisa both shows are male dominated. I am sure as ratings start to slide they'll have second thoughts about the set up and it won't be long before we changes... I'm prepared to be proven wrong but not sure we will see much of a Charlotte or Susanna presenting on the sofa. Regional news times for GMB. 0626, 0656, 0726 and 0756. None after 8am. gaztaylor wrote: f*** me, its like Loose Women, with fewer women. Does anyone on here work for the Daily Star? Bic Basher wrote: Regional news times for GMB. Seriously!? Surely ITV aren't deliberately trying to compete with the Beeb on a minute by minute basis. Short odds on them abandoning these times within six months. Bic Basher wrote: Does anyone on here work for the Daily Star? That wont last, they will be so desperate for viewers in a few months they will have her naked on the desk. magnet wrote: Same here. I will not be impressed if they deny us our daily Laura quota as a result of this change. The programme is awful , it's been on quarter of an hour and it feels much longer , on the upside Laura and Charlotte look great . Yes, it seems that ITV's cunning plan is basically an American-style show. Quite like the regional optouts. Have to agree,they look like 4 contestants on a tacky game show ! Typical ITV ! 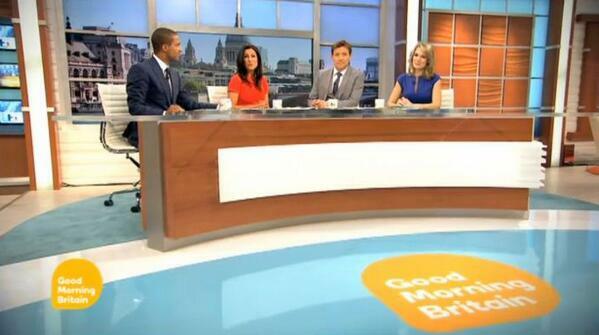 Rise and Daybreak in one breakfast show. To much going on. Looks terrible at the moment. Watched a bit of it this morning. Complete Junk.Wont be watching again also SR has turned into Bleakley. Totally in love with herself. A career in presenting celebrity Ice dancers diving into a lake in the Jungle whilst living in the Big Brother house shall be hers in a few years..
From a capping point of view, if you like Laura Tobin, fantastic. It should also reduce the amount of Susanna Reid caps considering she's mainly stuck behind a desk in the central position. Charlotte at least is on the end of the desk. In London, the presenter is still sitting down, which is the same for STV, but I'm aware most now stand up in front of the plasma, so no leg shots. As if we didn't already predict that there would be a backlash, I totally agree with one particular comment: 'It's like buying a Ferrari and keeping it in the garage!' (in regards to placing Susanna behind a desk). Cannot comment as have not seen any of it. Hawkins and Reid are two women I would not turn my nose, regardless of whatever they do. I didnt see any of it but from the pictures here, it certainly "looks" better and bit more polished in particular the on screen graphics. But yea I was expecting a big of leg and a small table. Not something which looks disturbingly similar to the Loose Women setup where they just sit across a large high table with newspapers and coffee's on. I'll try to find some footage of it, or better yet I'll watch some of it tomorrow. Personally I liked much more than I disliked. Promising and there is definitely potential to develop into a decent programme. I'm looking forward to seeing how it develops over the next few days and weeks as it settles down.